The Joy of Vegan Baking* is a wonderful introduction to vegan baking, with dessert recipes for both experienced and beginner cooks. Author Colleen Patrick-Goudreau is a long-time vegan, animal activist, and founder of Compassionate Cooks. Too many vegan dessert recipes are so full of healthy ingredients that the dessert seems more like ship ballast than birthday cake. That’s not a problem in Patrick-Goudreau’s cookbook. 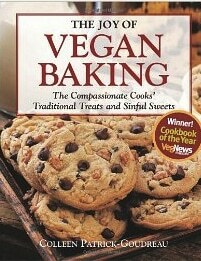 The Joy of Vegan Baking offers a range of delectable desserts that could never be mistaken for broccoli. I didn’t make the chocolate cake, but the lemon blueberry muffins, lemon bars, coconut pudding, and pancakes that I tested were easy to make and eaten by my family with gratifying enthusiasm. In addition to the recipes, Patrick-Goudreau offers an in depth explanation of dairy and egg substitutions that will allow her readers to make other non-vegan dessert recipes vegan. She also has several useful appendices covering such topics as baking terms, ingredients, and more. This review was contributed by Judy Kingsbury, from The Savvy Vegetarian.